Nicki Minaj is loosing money and she thinks that Christina Milian is to be blamed. The catch phrase first popped up in Nicki Minaj’s song “Feeling Myself” where she rapped about being pretty on fleek. The Young Money rapper blast Milian on Instagram saying she wants a cut off the profits. “Fleek by Onika ???? – I saw Christina sellin tshirts that say Pretty On Fleek. I was waitin on my percentage at the door! *tilts head*” Nicki wrote on Instagram. Christina Milian was selling the T-Sh**s on her new website WeArePopCulture.com. But last check they were taken down. Milian also responded to Nicki Minaj on Twitter and on Instagram. The two females have since put their differences aside. Milian is Nicki Minaj’s boss, Lil Wayne, girlfriend. 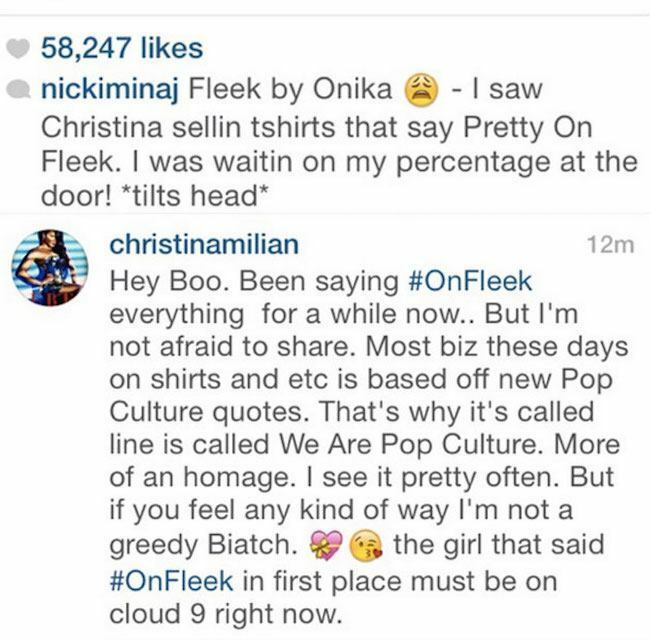 This is what Christina Milian wrote in response to Nicki Minaj.